My first contact with Matt Boroff’s music happened in 2004, and since then I have reviewed three of his albums that he recorded with his band the Mirrors. Currently he prefers his life as a solo artist, and even though he still has studio musicians helping out, Sweet Hand Of Fate should be considered his second self-released solo album. Even in the past Matt Boroff was not exactly known for what is called “joie de vivre”. This hasn’t changed of course, and therefore we still get very gloomy, partly even oppressive rock music located somewhere between Tito & Tarantula, Tom Waits and Screaming Trees. Matt Boroff even managed to get the latter’s erstwhile frontman Mark Lanegan as guest vocalist on Garbage Man. 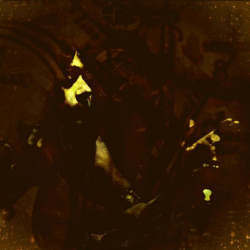 The ten songs on Sweet Hand Of Fate are mostly quiet and atmospheric, and are carried by Matt Boroff’s growling voice. Occasionally, but unfortunately not often enough, there is an inner anguish brewing up that lets the artist explode in a cathartic eruption. It would have helped the album’s variety if there had been more of these angry moments. Some tracks, like Sweet Hand Of Fate and X, are even so quiet that they might be considered inconspicuous. For my personal taste, Sweet Hand Of Fate leans a little too strongly towards the mellow side of the spectrum. If you are into depressive rock music and furthermore unafraid of occasionally distorted guitars, feel free to check out this pleasantly dark experience.